Vice President, Prof. Yemi Osinbajo, has dismissed rumours of a secret plan by the President Muhammadu Buhari-led Federal Government to Islamize Nigeria. 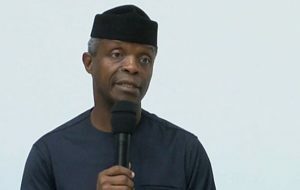 State House Chaplain, Pastor Oluseyi Malomo stated this on behalf of Prof. Osinbajo on Tuesday during the 2019 Religious Liberty Partnership Consultation in Abuja. According to The Sun, Pastor Malomo added that the federal government would rather promote religious freedom; as key to peaceful co-existence among its citizens. Malomo expressed displeasure over the state of division caused by religion which ought to serve as channel for harmony and nation building and therefore, appealed for religious tolerance among Nigerians for collective growth and development. In his words, “The commitment of this government is to ensure there is religious freedom in the nation, no matter how hard it is. “We are committed to that cause and must do all that is possible to get that done. It’s unfortunate that the religion which is supposed to help all of us live in harmony has become source of division for us. He added that the perception that policies and programmes of Buhari’s administration escalated religious crisis in some parts of Nigeria was wrong and should be corrected through mass advocacy in religious and social places. Also adding his view, former chairman, Nigeria Human Right Commission (NHRC), Prof. Chidi Odinkalu, who was the guest speaker at the event, expressed worry over the politicization of faith in the country. Prof. Chidi noted that freedom of worship, which is one of the constitutional rights of an individual, is not easily practised in some parts of the country because most of the killings are politically and religiously motivated. This entry was posted in Christianity, Faith, News, Politics and tagged Nigeria, Religious Liberty Partnership Consultation, Yemi Osinbajo. Bookmark the permalink.